If you read my account of going to the Woodford Reserve Distillery in Kentucky then you know where this story gets its influence. Our tour guide told us of a recent vacation he took to Ireland. I believe he also toured Scotland but he imparted a story about seeing his familiar Woodford Reserve barrels being re-purposed at the Old Bushmills Distillery. He knew that the barrels that Woodford emptied were resold to Ireland and Scotland distilleries to mature whiskies and now he had seen with his own eyes! Well his experience stuck in my head, and I thought, why not try some Bushmills product that is aged in bourbon casks and see if I can taste some similarities. The Bushmills Malt 10yr. is a product of two barrels, first a sherry cask and then most of the time is spent in a previously used cask from a bourbon distillery. Ok, so after shoveling down some Sushi I picked up at Harris Teeter I set out my tasting table. 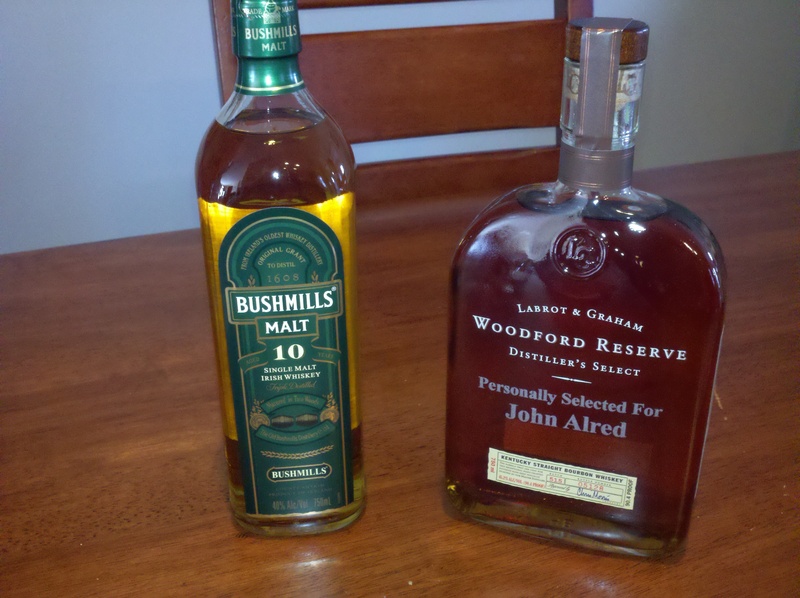 Into two glasses went about an ounce of each whiskey, one of Woodford Reserve Bourbon and one of Bushmills Malt 10yr. At the onset you can see that Woodford has a deep amber appearance and the Bushmills has a much lighter amber appearance. I then nosed the Woodford and my nose exploded with flavors! I wrote down vanilla, leather, and butterscotch. Then I wrote down Yummy!!! Yes I realize that yummy is not something a professional reviewer would write down in a review but then I have the luxury of not holding that title. But seriously, the aroma alone of Woodford is something special! Then I nosed the Bushmills, and then again, and again, come on!! Unlike the Woodford, I had to seriously NOSE this glass. It was almost like it didn’t want to play. The best I could get out of it was some hints of liquorice. Which confused me. Before tasting I added a very small amount of amount of VOSS water to each one and nosed them again. I was beginning to think this was going to be a failed experiment, but then it happened. The stubborn Bushmills came alive with the introduction of water and suddenly the same butterscotch I smelled in the Woodford was present in the Bushmills along with some honey. The Woodford on the other hand dropped a couple of aromas after the water was introduced but some wood flavor came through. All of a sudden I was taken back to the moment I walked into the warehouse at Woodford Reserve. That, as I wrote earlier, was an amazing olfactory event. Alas! I have found what I was looking for! These two whiskies have amazing similarities thanks to a very well fashioned and prepared barrel from Woodford Reserve Distillery. But this story doesn’t end, well for now it does. I tasted another Bushmills product after these two called “Black Bush.” Would it taste different?